The inhabitants of cities, towns, and villages are exposed to different levels of air pollution, which also vary throughout the day. Information regarding episodes of poor and good air quality enables planning to mitigate the risks and maximize the benefits of spending time outdoors. In this work, an analysis was made of the state of air quality 2012–2016, using data gathered from automatic measuring stations located in five cities (> 50,000 inhabitants), five towns (5000–50,000 inhabitants), and five villages (< 5000 inhabitants) in five neighboring provinces in central Poland, in Central Europe. The monitoring stations were designated as “city background”, “town background”, and “rural background”. More than 3 million pieces of data were collected from 15 monitoring stations. This allowed the average daily changes in the concentration of air pollutants (NO2 and NOx, O3, SO2, CO, PM10, PM2.5, C6H6) to be determined, depending on the type of station and the size of the settlement unit in both winter periods and summer periods. As a result, the most and least favorable hours in terms of levels of air pollution were identified. This information could help to inform air quality management in modern cities, towns, and villages and to improve the quality of life, particularly among those most susceptible to the negative effects of air pollution, such as the elderly and children. Worldwide air quality poses a risk both to human health and the wider environment (Agudelo-Castañeda et al. 2019; Ramírez et al. 2019; Oliveira et al. 2019). Studies on air pollution focus not only on inhabited areas (Cichowicz et al. 2017; Cichowicz 2018; Pérez et al. 2010) but also on agricultural and undeveloped areas, which are used as background measurements (Hagenbjörk et al. 2017; Putaud et al. 2004; Zheng et al. 2010). In many countries, including in Europe, air quality assessments use measurements performed by automatic measuring stations (Agudelo-Castaneda and Teixeira 2014; Malley et al. 2018; Wielgosiński et al. 2018) and air quality modeling (Cichowicz and Stelegowski 2018a; Inness et al. 2013; Menut et al. 2012). Usually, the average annual, seasonal, and monthly concentrations of air pollutants are analyzed (Cichowicz et al. 2017; Guerreiro et al. 2010; Malley et al. 2018). Much less information is available regarding daily fluctuations (Liu et al. 2014; Zhao et al. 2009). Daily variations in air pollution occur due to the high variability of sociophysical and chemical parameters during the day (Menut et al. 2012; Pérez et al. 2010). These changes depend largely on the day of the week (work days or weekends) (Feng et al. 2014; Chaloulakou and Mavroidis 2002) and the season (Vouitsis et al. 2015). The average hourly concentrations of air pollutants are usually analyzed only for cities (Agudelo-Castaneda and Teixeira 2014; Vouitsis et al. 2015) and in the vicinity of busy roads (Moreno et al. 2013; Pérez et al. 2010). There are few air-quality analyses on other types of area, especially for settlement units of different sizes, and those focus on average annual and seasonal pollution levels (Hagenbjörk et al. 2017; Malley et al. 2018; Putaud et al. 2004; Tecer and Tagil 2014) and only occasionally daily variations (Zheng et al. 2010). Concentrations of air pollutants depend on city density and on urban planning, and the level of industrialization also has an impact (Landim et al. 2018; León-Mejía et al. 2018; Saikia et al. 2018). The daily activity patterns of people, including time spent at home, working hours, and travel, are specific to particular areas and fluctuate during the day. The emission of air pollutants associated with such activities, and the concentrations of pollutants in the ambient air therefore vary (Cichowicz et al. 2017; Fenger 1999; Nicolai et al. 2003). Although people spend only 10–20% of their days outdoors, it is still important to provide information on air quality, especially for those most susceptible to the negative effects of air pollution, such as children, the elderly, and people with asthma and respiratory illnesses (Künzli et al. 2000; WHO 2000, 2005). Such information makes it possible for people to reduce their exposure to air pollution, for example in response to recommendations regarding the “most” and “least” favorable hours for staying outdoors. When there are high concentrations of air pollutants in the air, it is advisable to stay indoors. This is due to the inertia of the air in buildings, which can cause a “shift” and “lowering” of the daily maximum concentrations of several pollutants (Bouhambra et al. 2000; Hayes 1991; Chaloulakou and Mavroidis 2002). The flow balance of air pollution inside a building depends not only on outdoor air quality but also on the structure and air-tightness of the building, as well as indoor sources of pollution (Cichowicz et al. 2016; Cichowicz and Stelęgowski 2018b; Colbeck et al. 2008; De Paoli et al. 2018). However, according to the literature, there may be shifts of approximately 1 h and reductions of approximately 60% for CO (Chaloulakou and Mavroidis 2002), of 90% for O3 (Hayes 1991) and approximately 30% for benzene (Bouhambra et al. 2000). When there are low concentrations of pollutants outdoors, the situation is reversed. During such periods, it is better to stay outside, where concentrations can be half those in buildings (Chaloulakou and Mavroidis 2002). Hourly measurements of pollutant concentrations in the ambient air are taken across a network of national air monitoring stations in Europe (Guerreiro et al. 2010; EEA 2016). These measurement stations are located in the vicinity of point, areal, and linear emission sources and provide data on the air quality in areas of, inter alia, “urban traffic/kerbside” (UT), “urban background” (CB), “suburban background” (SB), “rural background” (RB), and “natural background” (NB) pollution (Putaud et al. 2004). There are various classifications of settlement units in European Union countries. To unify this division, the Organization for Economic Cooperation and Development with European Commission (OECD-EC) introduced the definition of a city as an urbanized area with a population of more than 50,000 and population density above 1500 inhabitants km−2 (Dijkstra and Poelman 2012). According to the definition developed in the European Territorial Observatory Network program (ESPON), towns are urbanized areas with populations of 5000–50,000 and population densities of 300–1500 inhabitants km−2 (Servillo et al. 2014). Daily variations in air-pollution level depend, to a large extent, on both meteorological conditions (Pérez et al. 2010) and human activity. Human activity profiles are relatively stable in particular areas, resulting in distinctive patterns air pollutant emissions (Gaffron 2012; Menut et al. 2012). However, the concentrations of air pollutants in a given area are influenced by many factors, none of which often is decisive. Depending on the location of the measuring station, the levels of air pollution can be more or less closely associated with particular factors. 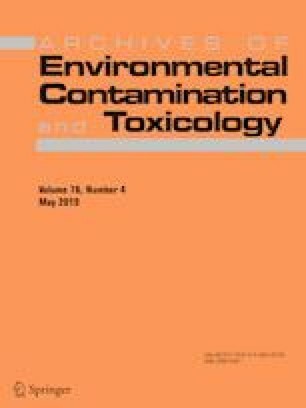 This has been confirmed by studies in which, for example, an analysis of the urban background pollution in the cities Canoas and Esteio in Brazil showed a correlation between O3 and solar radiation intensity, and no correlation between PM10 and air temperature (Agudelo-Castaneda and Teixeira 2014, 2017; Vouitsis et al. 2015). The Pearson correlation coefficient between O3 and radiation intensity was 0.558 (average) and − 0.186 (low) for PM10 and ambient temperature (Agudelo-Castaneda and Teixeira 2014). However, at a short distance from the emission source, the relationship was much stronger. This was confirmed by analyses carried out near a busy road in the city of Thessaloniki (Greece). The Pearson correlation coefficient between NO and CO and road traffic intensity was significantly stronger: 0.91 and 0.94 respectively in summer, and 0.89 and 0.40 in winter (Vouitsis et al. 2015). The changes in NO concentration during winter and summer seem related mainly to changes in road traffic intensity. Changes in CO concentration in winter were possibly associated with other factors, such as emissions from fuel combustion for heating purposes. Poland is located in a temperate transitional climate zone. There are low temperatures in winter, reaching approximately − 14 °C (5th percentile) and on average ranging from approximately − 3 to + 1 °C (http://old.imgw.pl/klimat), depending on the region. As a result, there are high levels of pollution from fuel combustion for heating purposes (nonindustrial combustion). In contrast, temperatures in summer are significantly higher, reaching approximately + 28 °C (95th percentile), and on average ranging from approximately + 13 to + 19 °C (http://old.imgw.pl/klimat), depending on the region. Therefore, there are high levels of pollution from transport in summer. Most of Poland is located in the North European Plain, consisting of low plains. The north part of Poland is a coastal lowland adjacent to Baltic Sea, and the south part includes highlands and the Carpathian Mountains. The analyzed regions of Great Poland, Lodz, and Masovia are located in the lowlands (elevation up to 300 m). The Lublin region includes mostly lowlands, highlands (elevation up to 390 m), and Lower Silesia consists of lowlands, highlands (up to 718 m), and mountains (up to 1603 m). The chosen areas are similar for weather conditions. The annual average air temperature is 8 ± 1 °C, precipitation is approximately 600 mm, with higher values (up to 1300 mm) in the mountains (SP 2018). However, the prevailing rainfall occurs in summer. The mean monthly humidity usually range from 60 to 90%. The dominant wind direction is west, and the average velocity is 3 m s−1. The average insolation is 1600 h, and average solar radiation is 1000 kWh/m2. In 2015, approximately 91% of energy was generated from nonrenewable sources in Poland, primarily from hard coal and lignite (51%), crude oil (25%), and natural gas (15%) (IEA 2017). The share of urban population in the total population of a region amounts to approximately 46% in Lublin voivodeship, 55% in Greater Poland, 64% in Lodz and Masovia, and 69% in Lower Silesia. The dominant air contamination sources in the chosen areas are power industry, industrial and nonindustrial combustion, and road transport. Those economy sectors contribute to 97% of SO2, 80% of NOx, and 70% of PM10 emissions in Poland (Dębski et al. 2015; SP 2017). The amount of total gaseous emissions form point sources in 2017 was 12.0 × 106 Mg/year in Lower Silesia, 14.4 × 106 Mg/year for Greater Poland, 43.2 × 106 Mg/year for Lodz, 29.1 × 106 Mg/year for Masovia, and 5.0 × 106 Mg/year for Lublin region. Dust emissions were 1.9 × 103 Mg/year, 4.0 × 103 Mg/year, 2.3 × 103 Mg/year, 2.7 × 103 Mg/year, and 1.7 × 103 Mg/year respectively (https://bdl.stat.gov.pl). High point emissions in Lodz region were mainly caused by power industry, especially by large power plant “PGE GiEK” Belchatow. This power plant has 5342 MWe electric power and uses brown coal as a fuel (Cichowicz and Stelegowski 2018c). It is placed 35 km from the analyzed location in Piotrków Trybunalski city, 60 km Lodz city, and 100 km from Gajew village. In Greater Poland region, there is the “ZE PAK” (http://zepak.pl/en) power plant complex (2512 × MWe, fuel: brown coal), placed 10–30 km from the analyzed locations in Konin city, 35 km from Piaski village, and 130 km from Poznan city. Also, each city and town in this analysis has its own, but smaller (< 500 MWe), power or combined heat and power plant, providing energy and/or heat for central part of its urbanized area. Due to the specific characteristics of emissions in different areas, it was decided to analyze the changes in the average hourly concentrations of air pollutants at various locations in Poland, depending on the size of the settlement unit. The analysis focused on the selected air pollutants, which are harmful to human health: the gaseous substances NO2, NOx (NO + NO2), SO2, O3 and CO, as well as the dusts PM10 and PM2.5 and benzene (C6H6). The analysis covered a period of 5 years from January 2012 to December 2016. The data were gathered from automatic air monitoring stations and were made available by the Voivodship Inspectorates for Environmental Protection (WIOŚ) and by the Main Inspectorate for Environmental Protection (GIOŚ) in Poland (http://powietrze.gios.gov.pl/pjp/current). The monitoring stations were categorized based on the character of the emissions, as city background (CB), town background (TB), or rural background (RB). Data from 15 monitoring stations were selected for analysis: five stations located in cities (CB stations), five in towns (TB stations), and five in villages (RB stations). The CB and TB stations were located in the surroundings of dense residential and service buildings, away from large point air pollution sources. RB measuring stations were located in the agriculture areas. Due to the prevailing western and south-western wind directions in Poland, all the selected measuring stations were on the “west–east” line, between 50 and 53°N latitude and 15–24°E longitude. This area comprised five provinces in central Poland (Fig. 1). In the following analysis, the locations are designated using symbols relating to the size of the settlement units and their location in a particular voivodship: L—city, M—town, S—village; 1—Lower Silesia voivodship, 2—Greater Poland voivodship, 3—Lodz voivodship, 4—Masovian voivodeship, 5—Lublin voivodeship (Tables 1, 2, 3). The measurements were made at automatic air monitoring stations, according to the reference or equivalent methods (Table 4). However, due to technical/service breaks in the operation of individual measuring stations, full data could not be obtained for all gaseous substances and dusts. Therefore, only the data from years with at least 75% completeness for a particular station were used in the analysis. The average hourly concentrations were thus determined based on the number of years that met this criterion for a given station (Table 5). In Poland, the levels and nature of air pollutants vary significantly between in winter periods (WPs) and summer periods (SPs). Therefore, the measurements were divided into two seasons. It was assumed that WP lasted from October 1 to March 31 and covered the entire heating season, whereas SP lasted from May 1 to August 31 and covered the vegetation period. 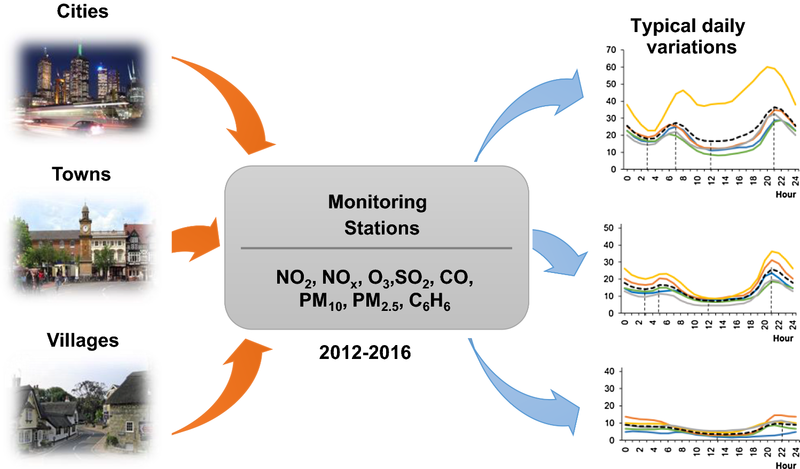 The analysis of average hourly pollutant concentrations in the ambient air at stations CB, TB, and RB, in WP and SP in the years 2012–2016, revealed daily variations in air pollution levels. The periods during a “typical” day were identified when the daily maximum and daily minimum average hourly concentrations of pollutants occurred. Mean hourly NO2 concentrations in WPs ranged from 14.12 to 57.27 μg m−3 in cities, from 11.06 to 32.98 μg m−3 in towns, and from 9.10 to 16.41 μg m−3 in rural areas (Fig. 2). In SPs, the mean hourly NO2 concentrations ranged from 8.29 to 60.10 μg m−3, from 4.47 to 36.33 μg m−3, and from 1.75 to 4.47 μg m−3 for cities, towns, and rural areas, respectively (Fig. 3). This means that the lowest concentrations occurred during SPs and the highest in winter, except at locations L4 and M4 (stations in the Warsaw city and the town of Piastów in the Mazovian Province). The shape of the NO2 daily profile was always close to a bimodal distribution, with two distinct minima and maxima. The daily maximum concentration was higher in the evenings than in the morning. The lowest concentrations occurred in SPs in the afternoon and, importantly, remained at a similar level for 6–12 h. However, these periods of low NO2 concentrations were much shorter, lasting 1–4 h. The shapes of the hourly profiles for the same type of settlement unit were similar. The average hourly NOx concentrations in WPs ranged from 20.27 to 142.77 μg m−3 in cities, from 16.54 to 61.86 μg m−3 in towns, and from 10.74 to 18.33 μg m−3 in rural areas (Fig. 4). The concentrations were lower in SPs and ranged from 12.56 to 110.57 μg m−3, from 8.11 to 45.79 μg m−3, and from 2.16 to 18.80 μg m−3, respectively (Fig. 5). The shape of the NOx daily profiles was close to a bimodal distribution, similar to the NO2 profiles. However, in the case of NOx the morning and evening peaks had similar values. This was most likely caused by NO emissions resulting from the morning rush hours. However, in summer in the cities of Wrocław (L1) and Warsaw (L4), the morning NOx peak concentrations were higher than those in the evening, probably due to the heavier traffic congestion. The shapes of the NOx profiles were similar for particular types of settlement unit. The NOx level was also lower during SPs than in WPs in the cities and towns. Similar results were previously reported (Schneider et al. 2016; Garcia et al. 2014; Martinello et al. 2014). The average hourly O3 concentrations in WPs ranged from 20.02 to 41.23 μg m−3 in cities, from 22.62 to 48.73 μg m−3 in towns, and from 25.98 to 52.10 μg m−3 in rural areas (Fig. 6). The concentrations were higher in SPs, ranging from 29.98 to 92.27 μg m−3 in cities, from 21.61 to 94.67 μg m−3 in towns, and from 21.46 to 96.08 μg m−3 in rural areas (Fig. 7). Ground-level ozone concentrations generally increased as the size of the settlement unit decreased. This confirms the results of previous scientific studies (Guerreiro et al. 2010; Hagenbjörk et al. 2017), which showed that the level of O3 decreases as the NO concentration in the air rises. The NO level was usually higher in those areas with heavier traffic. However, the lowest O3 concentrations in SPs occurred in cities and were higher than the minimal values in towns and villages. Daily fluctuations in O3 levels were the widest in rural areas. This contradicts research into ground-level ozone concentrations in different types of area carried out by Zheng et al. (2010), who reported smaller ozone changes in villages than in cities. The shapes of the ozone profiles were similar for particular types of settlement unit. The daily profiles for O3 concentrations were similar to a bimodal distribution in the case of towns and cities, and unimodal for the villages. The maximum values occurred, irrespective of the season and the size of the city/village, at around 14:00–15:00 local time. The sudden drop in O3 concentration was more significant in the case of larger settlement units and occurred at 7:00–8:00 (local time) in WPs and around 5:00 (local time) in SPs. This could be related to the decrease in the level of ozone, which reacted with nitrogen oxide emitted during the morning rush hours. The shape of the O3 diurnal profile in cities during winter is puzzling, because the level of ozone at night increased and at around 3:00 (local time) reached almost ¾ of the maximum daily value. The average hourly SO2 concentrations in WPs ranged from 4.36 to 21.27 μg m−3 in cities, from 4.84 to 23.29 μg m−3 in towns, and from 3.28 to 7.74 μg m−3 in rural areas (Fig. 8). The concentrations were much lower in SPs, ranging from 1.30 to 8.12 μg m−3 in cities, from 2.11 to 5.65 μg m−3 in towns, and from 1.40 to 5.19 μg m−3 in rural areas (Fig. 9). The level of SO2 was generally the lowest in villages and higher in towns and cities. In the Greater Poland and Lublin regions, the concentrations of sulphur dioxide in the cities of Poznań (L2) and Lublin (L5) were lower and comparable to those occurring in the towns of Piaski (S2) and Biały Słup (S5). The highest SO2 level occurred in the Łódź region (Gajew/S3, Piotrków Trybunalski/M3, and in Łódź/L3), where there is a very extensive network of power stations. Therefore, it was assumed that changes in SO2 concentrations were related to industrial power production in SPs and to emissions from the combustion of fuels for heating individual buildings in WPs. The shapes of the SO2 daily profiles were similar to unimodal (in SPs) or bimodal (in WPs) distributions. The unimodal character of the profiles was more pronounced in SPs than in WPs, with a peak around 10:00 local time. Of the 15 selected monitoring stations, 8 measured CO concentrations in the ambient air. These were located mainly in cities. Unfortunately, there were no CO measuring devices installed at the other 7 stations, located in smaller settlement units. The average hourly CO concentrations in WPs ranged from 0.33 to 0.99 mg m−3 in cities, from 0.29 to 1.03 mg m−3 in towns, and from 0.33 to 0.44 mg m−3 in rural areas (Fig. 10). The concentrations were lower in SPs, ranging from 0.17 to 0.61 mg m−3 in cities, from 0.17 to 0.51 mg m−3 in towns, and from 0.20 to 0.24 mg m−3 in rural areas (Fig. 11). The CO level in the countryside changed only slightly during the day, in contrast to the fluctuations observed in towns and cities. The CO profiles were similar to a bimodal distribution and comparable to the NO2 daily profiles. The highest peak in CO concentrations was in the evening, at 20:00–22:00 (local time), in both WP and SP. Of the 15 selected monitoring stations, 10 measured PM10 concentrations in the ambient air. These were mainly located in cities. Unfortunately, there were no PM10 measuring devices installed at the other 5 stations, located in smaller settlement units. The average hourly PM10 concentrations in WPs ranged from 28.76 to 62.54 μg m−3 in cities, from 31.00 to 75.87 μg m−3 in towns, and from 25.07 to 43.16 μg m−3 in rural areas (Fig. 12). The concentrations in SPs ranged from 17.08 to 35.63 μg m−3 in cities, from 16.09 to 34.00 μg m−3 in towns, and from 15.90 to 28.78 μg m−3 in rural areas (Fig. 13). Therefore, during WPs the PM10 levels in towns and cities were similar. In villages, they were approximately 50% lower. The PM10 profiles at each location were characterized by a bimodal distribution but with different shapes. The highest PM10 concentrations during WPs occurred in the evening. This was in contrast to during SPs, when some locations (Wrocław/L1, Warsaw/L4, Konin/M2, and Gajew/S3) saw their highest PM10 concentrations in the morning, around 6:00–8:00 (local time). In others (Poznań/L2, Łódź/L3, Lublin/L5, Kłodzko/M1, Piotrków Trybunalski/M3, and Belsk Duży/S4), the highest peak occurred in the evening at 21:00–22:00 (local time). In the Polish air quality monitoring system, only CB stations measure PM2.5 and benzene concentrations in the ambient air. The average hourly concentrations of PM2.5 in cities differed significantly depending on the season, ranging from 23.24 to 46.42 μg m−3 in WPs and from 8.40 to 18.18 μg m−3 in SPs (Fig. 14). The concentrations in SPs were approximately three times smaller than during WPs and were lowest from 10:00 to 18:00 local time (depending on the location). The maximum values during WPs occurred in the evening at approximately 21:00 (local time). In SPs, the peak hours occurred between 6:00 and 24:00 local time. Interestingly, there were high concentrations of PM2.5 throughout the night in SPs. Previous research on the composition of dust in urban areas of Barcelona, Spain (Pérez et al. 2010) had also indicated the presence of large amounts of organic matter, molecular carbon, and aerosols in PM1–2.5 (approximately 48% of mass) and in PM1 (around 85%) in urban ambient air. While in PM2.5–10 it contributed only to 24%. This is puzzling, because sources of anthropogenic emissions are inactive at night during summer months. Therefore, it can be assumed that the increase of PM2.5 concentrations at night might be associated with the condensation of water vapor and the coagulation of fine dust particles (Pérez et al. 2010). However, in the study of air quality in Thessaloniki, Greece (Vouitsis et al. 2015), the concentrations of particle number (PNC), PM2.5, and PM10, increased during the night (with peak at 23:00–24:00) mostly in the winter period in traffic-affected sites, whereas in city-background locations this was not clearly noticeable. On the other hand, in this analysis, PM2.5 concentration decreased at night in winter, until around 3:00 local time. The differences in the shapes of the profiles and peak hours for PM10 and PM2.5 also were interesting. The diurnal variations in PM10 concentration took various shapes in cities, whereas the concentrations of PM2.5 followed very similar patterns. In addition, PM2.5 concentrations in the morning peak occurred 2 h earlier than the PM10 peak hours. In the study by Pérez et al. (2010), at weekdays the peaks in PM1 and PM1–2.5 occurred at 6:00–9:00, whereas peak in PM2.5–10 occurred at 10:00–15:00. At weekends, it was around 2:00–8:00 and 11:00–12:00, respectively. However, in the case of traffic-affected site in the center of Madrid, Spain, the peaks in PM2.5 and PM10 were very close to each other (± 0.5 h) and occurred at 8:00–9:00 and 20:00–21:00 (Moreno et al. 2013). Also, in urban areas, the average PM2.5 concentration are usually strongly correlated (R2 > 0.80) to PM10 and amounted to 60–90% of PM10 concentrations (Gupta et al. 2006; Pérez et al. 2010). Nevertheless, observations of PM could indicate that differences in the varying concentrations of course and finer particles in the urban environment might be partially due to the different processes of their formation (Pérez et al. 2010). As in the case of PM2.5, the concentrations of benzene (C6H6) in cities changed and varied significantly depending on the season. The average hourly benzene concentrations ranged from 0.48 to 1.42 μg m−3 in WPs and from 1.84 to 5.47 μg m−3 in SPs (Fig. 15). The benzene level in the summer was three to four times lower than in winter. The highest concentrations always occurred in the evening, between 21:00 and 22:00 local time. The shapes of the average daily profiles of NO2 and CO, and NOx and PM10 were compared for different settlement units (Figs. 16, 17, 18, 19). This was to verify the generally prevailing opinion that the NO2 and NOx concentrations usually indicate road transport intensity, whereas the occurrence of CO and PM10 indicate emissions from road transport and area sources (so-called “low emission”). It was observed that there was a co-occurrence of changes in the concentrations, as well as of “peak hours” and “low hours,” in both WPs and SPs. The high correspondence between the profile shapes in SPs could indicate the impact of emissions from linear sources. However, it is more difficult to explain their consistency in WPs, when there also were area emissions related to the heating of individual buildings. The shapes of the average hourly benzene and PM2.5 profiles were compared for cities during WPs and SPs (Fig. 20). The presence of PM2.5 in the ambient air is due mainly to the burning of fossil fuels (50% of energy in Poland is generated from hard coal and lignite, while crude oil provides 26% and natural gas 15% of the country’s energy needs). Approximately 76% of PM2.5 emissions originates from fuel combustion in power generation, industrial, and nonindustrial combustion (Dębski et al. 2015). The presence of benzene results from tobacco smoke and from burning liquid fuels in car engines (WHO 2000). Also, in the transport-affected sites, the carbonaceous compounds are substantial (35–48%) components of PM2.5 (Gómez-Perales et al. 2004; Harrison et al. 2004, Pérez et al. 2010). In the analyzed locations, the changes in PM2.5 and benzene levels had similar hourly profiles, indicating the co-occurrence of these air pollutants in urbanized areas. The co-existence of PM and benzene (correlation coefficient of 0.69–0.97) during the transport rush hours were previously reported (Gupta et al. 2006). There were significant shifts between the occurrence of the daily maximum and daily minimum in WPs and SPs (Tables 6, 7, 8). The most favorable conditions, in terms of levels of air pollution, occurred in towns and cities in the morning at 3:00–5:00 (local time) and in the afternoon at 12:00–15:00. In the villages, the best air quality occurred between 4:00 and 6:00 (local time). On the other hand, during WPs the least favorable conditions in terms of air quality occurred, regardless of location at 8:00–10:00 and 19:00–21:00 (local hour). In SPs, air quality was poorest at the following times: 7:00–8:00 and 21:00–22:00 in cities; 5:00–6:00 and 21:00–22:00 in towns; 6:00–9:00 and 19:00–22:00 in villages. For a comparison, when considering PM and NO2 air contamination, in urban-traffic area in Madrid (Spain), the most favorable conditions occurred at around 4:00 and 15:00 local hour (Moreno et al. 2013). In Barcelona (Spain), this was around 15:00 (Pérez et al. 2010), and in Thessaloniki (Greece) around 4:00–6:00 and 15:00–18:00 (Vouitsis et al. 2015). For comparison, in the cities of Canoas and Esteio, in Brazil, the most favorable air quality conditions occurred at 4:00–6:00 and 14:00–17:00 (Agudelo-Castaneda and Teixeira 2014). According to the literature (Gaffron 2012; Menut et al. 2012; Moreno et al. 2013; Pérez et al. 2010; Vouitsis et al. 2015), daily variations in NO2 and PM10 concentrations show a shift between peak hours during road transport rush hours (Table 9). In selected locations in Central Europe, shifts of ± 3 h have been reported in the morning and of up to + 5 h in the evening. In cities of South-Western Europe, this shift reached up to + 4 h in both the morning and in the evening. In the city of Thessaloniki (Greece) in South-Eastern Europe, there was a shift of ± 4 h in the morning and 0–3 h in the evening. Therefore, the “most and least favorable” ambient air-quality conditions were not strictly related/correlated to road traffic intensity in cities, towns, and villages. However, the “time shift” between emissions and increases/decreases in air pollutant concentrations could be the result of meteorological factors, which may (or may not) result in dispersal processes and coagulation, as well as in chemical and photochemical processes. The purpose of this investigation was to determine the “most” and ‘”least favorable” hours during the day in terms of ambient air quality for different types of settlement unit (cities, towns, and villages). The results could be used to help improve air quality management process in cities, towns, and villages. The concentrations of air pollutants were found to change dynamically during the day. Each air pollutant had a unusual, characteristic daily concentration profile, resembling a unimodal or bimodal distribution. The profiles changed significantly depending on the season. The concentrations of SO2, CO, PM10, PM2.5, and benzene were significantly higher in winter periods than during summer. The time between “peak hours” of air pollutant concentration during the day also was shorter in the winter. The level of air pollutants was generally higher in the analyzed cities than in the towns and villages. Although the level of air pollution depended largely on the size of the settlement unit (city, town, or village), the daily profiles of the concentrations of air pollutants had relatively similar shapes. There were clear local maxima and minima during the day. The peak hours for air pollution usually did not coincide with the assumed traffic-intensity peaks (rush hours). This is in contrast to claims made in the literature that air pollution depends largely on road-traffic intensity (Agudelo-Castaneda and Teixeira 2014; Menut et al. 2012; Moreno et al. 2013, Pérez et al. 2010). Our analysis shows that there was a time shift of ± 5 h between the peak hours of air pollution and the transport rush hours. However, this time shift depended on the type of air pollutant, the season, and the size of the settlement unit. Different approaches can be used to assess the daily changes in the concentration of pollution. It also is difficult to identify the most important air pollutants. The best and worst conditions in terms of ambient air quality should be determined individually for each country/region, depending on the pollutants, the climate, and the characteristics of the emission sources. Our analysis focused on high concentrations of NO2, CO, dust, and benzene, which were characterized by similar shapes of average hourly changes. Less attention was given to O3 and SO2. This was due to the fact that in the temperate climate of Central Europe, the ozone concentration in summer rarely exceeds permissible standards in cities and villages. Concentrations of sulphur dioxide in such areas are nowadays also very low. In Poland, this is a consequence of the modernization of the power generation sector (Cichowicz et al. 2017, 2018). However, permissible levels were exceeded in the cases of particulate matter (Wielgosiński et al. 2018; EEA 2016), benzene, and benzo(a)pyrene (EEA 2016) during winter periods. These air pollutants are related with the burning of fossil fuels for heating individual buildings. Our analysis indicates that during winter the highest concentrations of pollutants occurred in cities, towns and villages in the mornings at 8:00–10:00 and evenings at 19:00–21:00 (local time). In summer periods, unfavorable conditions occurred in the mornings at 5:00–9:00 and in the evenings at 21:00–22:00 (local hour). The periods of worst air quality in the various settlement units differed by ± 2 h. The best ambient air-quality conditions in cities, towns, and villages, with the exception of ozone and taking into account mainly concentrations of NO2 and dust, occurred in the early mornings and in the afternoon. Therefore, the most favorable ambient air-quality conditions occurred between 3:00 and 5:00 and between 12:00 and 15:00 (local time). This information is particularly valuable for people to schedule outdoor activities, such as recreation or sport, as well as for structuring the working day (e.g., lunchtime, which usually takes place at 12:00–13:00) and time spent outside buildings. As a result, for example, children and the elderly may be recommended to engage in outdoor activities before 18:00 in urban areas during summer, because later in the day there is an increase in the concentrations of dust, NO2, and CO. However, there is a higher concentration of ozone at this time. Thus, air quality should be assessed on a case-by-case basis, for each area/region, taking into account both the type of settlement unit, its geographical location, the climate, and the types of emission sources. The authors thank the Voivodship Inspectorates for Environmental Protection (WIOŚ) in Poland and the Chief Inspectorate for Environmental Protection (GIOŚ) in Poland for allowing the use of measurement data obtained from air quality monitoring stations.